Mizushima recently began creating stop-motion animations using her felted creations, and has been commissioned to make several music videos for the ultimate geeky band, They Might Be Giants. I especially love the “Insect Hospital” video, where sick and injured bugs get fixed up with various computer parts. She has also been making super-short animated gifs, including this amazing self-extinguishing firebug. 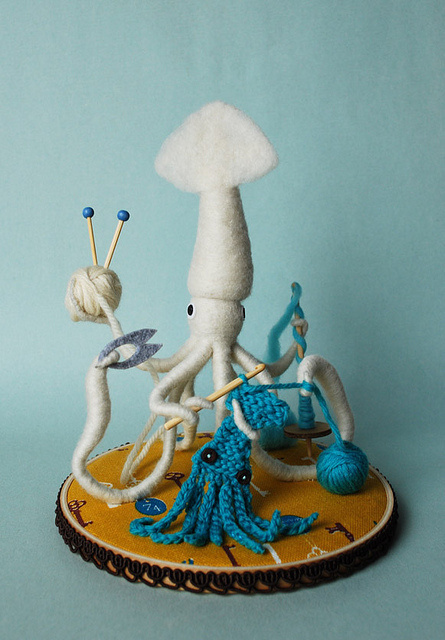 This entry was posted in The Art of Science and tagged Hine Mizushima, needle felting, science art, science craft, science etsy, slug art, squid art. Bookmark the permalink.